Memorial Day has come and gone. Bring out the white shoes and the summer gear! Being a homeschool mom, the amount of time that my kids are home is no different in the summer than it is in the school year, but it’s still fun to plan things for summer. Our church has VBS next week! The kids are so excited. It will wrap up right before we leave for MN. 2. Help the kids do a lemonaid stand. Ethan really wants to do one for raising money for Blood Water Mission. He’s been hearing about it on the radio 🙂 I have some ideas on how to make it work. Not sure yet. 3. Go to one of the Movie In The Park events in Franklin. 4. Sign up for the summer reading program at the library. 5. Hand out freezies to the kids at the pool. 6. Go to Dairy Queen! 8. Buy something at the farmer’s market. 10. Pick some craft projects to do with the kids. Having a house that is underwater (literally and figuratively at the moment…. sigh….trying to stay away from watching the weather radar) in MN means that we need to rent for a while with our move here to TN. In the process, we ended up renting a townhome in a home owner association that has a pool. We’re in a big enough development that some folks have to walk several blocks to get to the pool. We’re lucky enough that it’s in our back yard. I’m still getting used to that. It’s like being on vacation all the time. We’ve gone swimming three days in a row. The kids love it, but I’m thinking that, at some point, I’m going to fall over from exhaustion! So far, we’ve gone three days without sunburns. I’m pretty proud of that since it’s been very hot and sunny. 95 degrees today and the summer is only starting! This northern body is in shock. I’m going to need to increase the sun screen budget, buy swimming shirts for the kids and buy myself a hat so I can keep my head from burning. You know how in Minnesota it’s miserably cold for so long and you’re stuck inside for months on end? I think you reverse that, and that’s the summer situation in the south! We’re enjoying it for now. We’re kicking off our summer with swimming, ice cream cones, hamburgers on the grill and potato salad (I miss the Mrs. Gerry’s brand from MN). Come on down! The water is great! Author amyPosted on May 27, 2012 Categories life4 Comments on Vacation Every Day? It’s so nice to be able to take all 3 kids to the pool by myself and not have to make them all sit on the steps by Isaac since most of the pool is 4 feet deep. Author amyPosted on May 26, 2012 Categories life2 Comments on Summer! I’m re-posting this in honor of the SheReadsTruth community. If you’re looking for a simple and powerful way to make the most of your Bible study/Bible reading time, the S.O.A.P method is a powerful tool! Sounds easy already, doesn’t it? Why a Bible? Because it’s God’s Word directly to you. He has something to say to YOU! “Our Daily Bread” and “My Utmost For God’s Highest” are great and so are other devotional books and you can learn from them, but it’s good to go directly to the Source. 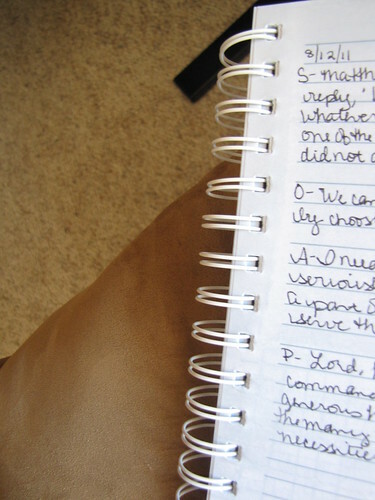 Why a Journal? You’re going to be writing things down as you’re doing your Bible reading (more on that later). Why a Bible Reading plan? If you’re like me, it’s easy to get distracted and spend half your time flipping through the Bible and wondering what to read next. Or maybe you read the same passage over and over again and end up missing out on all the other awesome gems in the Bible. If you use a plan, you don’t have to spend time figuring out what to read every day. There are tons of reading plans that you can google and find online. The She Reads Truth community is currently using the Soul Detox reading plan from youversion. To use that plan, create a username, login and search for Soul Detox. Use whatever plan you want. The point is to have some sort of plan. Why a daily planner/calendar? This is for the times when you go and start your devotions time and you think of something you’re going to have to do or remember for later. Instead of getting up and doing it right then and forgetting to come back, you can write it on your calendar and free that space up in your brain. Why something to write with? You’re going to be writing. 🙂 If you were going to a meeting with someone who knew everything that you needed to know about your job, you would probably take something to take notes with. It’s the same idea here. So, what exactly is S.O.A.P.? I’m so glad you asked! For “S” write down one particular scripture verse or section that stood out to you. Just one. If you do this every day, you’re going to have A LOT of truths to look back on and see what God was showing you. More than one thing and it becomes more difficult to manage. For “O” write down your observations. For “A” write out an application to your own life. For “P” write out a prayer of response. Do you know why I like it so much? I love that it’s interactive! As I open my Bible (or web browser)I’m asking that the Lord would speak and show me the things that He wants to show me. Then I listen, take notes and respond. It makes my time spent in the Word more meaningful and focused. If you have something that works well for you, I’m not saying you should change. But, if you’re like me and struggling sometimes with direction or motivation, maybe this will help! We are wrapping up our school year. We’ll be done at the end of this week. “Done” is kind of a relative term. I think we’re still going to work on math and handwriting a couple of times a week. Ethan has switched to Singapore Math and it looks like it will be lots of fun! Audrey is having fun working on learning her letter sounds. Once we add a vowel sound, we’ll be soooooo close to reading actual words. Woot! The weather has been in the mid-80’s. Today it’s only 75. I’m enjoying the days that we don’t need to use the central air. On Friday it looks like a high of 92 is in the forecast. Perfect timing for the opening of the pool. We are very excited about that! I’m counting the days until my birthday (it’s soon!). Isaac’s will be 3 on June 3rd! Nathan is having supper with Dave (THE Dave!) and a handful of other people hired around the same time. I can’t wait to hear how it goes. I’ve been struggling with my eating and my weight. At the beginning of May I was up 12 pounds from a year ago and a year ago I was about 10 pounds more than I wanted to be. If my math is correct, that means I have about 22 pounds I would like to drop. Staying motivated has been hard. Afternoons and evenings are times I want to graze constantly. I’m working on having more good days than bad ones. I think I’ve lost 3.5 pounds this month. Nathan recently wrapped up a web development project and I volunteered him for a new one. Oh my heart. Wasn’t she just 7 lbs a minute ago? Audrey and I had a lovely time during Isaac’s nap today. Snuggling and telling her the story of all the kid’s births, looking at photo albums, fixing our hair and playing with Barbie dolls. What an honor it is to be the mom of these three crazy kids. THREE! Having a 7 year old, 5 1/2 year old and an almost-3 year old is an adventure. It’s a good life. The last post about how long it was taking to feel at home at our church started a great discussion between Nathan and I. After all that waiting, we both agreed that we were going to a place that wasn’t a good fit for us and we already knew where we wanted to be instead. I had already started building friendships with some of the women at another church through the Moving On Bible study and several of Nathan’s coworkers attend there. Nathan and I are both very happy about the change. I think that sometimes discontent is placed there by God to move us toward something better He has planned. Did I mention we were happy about the decision? Actually, I’m jump-up-and-down-excited. The church-thing was one very big puzzle piece in making Franklin feel like “home”. One of the best things about this move has been that I’ve been able to find women whose lives aren’t too full for new friends. Winsted was a nice town and I really miss my friend, Marie, but so many of the people that we met were too busy for relationship. It was kind of strange and sad. I hope I never get to that point. I know it wont be easy, but I want to remember what it’s like to be alone and be sensitive to that. Ethan and Audrey both had performances last night! Audrey was in the preschool choir. They were adorable. Ethan was in a mini-musical. They did 4 songs. They all had aprons on because they were chefs in God’s kitchen. I wasn’t able to get a clear shot of Ethan. I was a proud mama! They sang their little hearts out and I was very pleased. Author amyPosted on May 7, 2012 Categories family1 Comment on Musical Success! Nathan and I have been going through the new-comers class (called Discovery) at our church. Last Sunday, as the pastor was wrapping up his portion of the class, he asked if anyone had questions. I’m pretty sure my husband got nervous when I raised my hand. I asked how often the Discovery classes were held. He said that the next one would be in August. That’s 3 months away. I plunged ahead with some thoughts I had. At this point, I was certain that Nathan was worried about what I would say. The background on this is that we had waited almost 3 months to be a part of this Discovery class. For some church congregations this might work well. In the case of this church, it’s a bit more problematic. This particular church specifically does NOT have many things happening at the building where they meet for church. They really want people “being the church” outside of the church building. The way to connect with people is to go through the Discovery class and then be placed in a community group. We’ve spent three months attending this church and there have been almost no opportunities to get to know anyone. So, I spoke up in class. I said that three months was a very long time to wait when you’re new to a community, don’t know anyone and are lonely. You know what? A good number of the people in the class with us agreed. 1)What does your church do to reach out to those who are new? 2)What have you seen that works well or doesn’t work at all (this would vary by person, obviously!) to assimilate new people?